Muso Jikiden Eishin-ryu Iaido (Iaijutsu) is the Japanese martial art of swordsmanship which emphasizes drawing and cutting with the samurai sword (called a ‘katana’) in a single fluid motion. Muso Jikiden Eishin-ryu is a ‘koryu bujutsu’ (which means ‘traditional martial art’) with a direct liniage back over 450 years to its founder, Hayashizaki Jisuke Shigenobu, who developed this particular style of swordsmanship. The Jikishin-kai honbu dojo emphasizes traditional practices and application of the techniques of the Muso Jikiden curriculum. This curriculum encompasses the practice of waza (solo techniques of which there are over 40), katachi (paired patterns using a wooden sword or ‘bokken’), and also tameshigiri (test cutting using a live/sharp sword on rolled mats). These three components serve to reinforce and improve the other to make the student of Iaijutsu aware of proper body mechanics, focus, and technique for the effective use of the sword. All three of these, plus the integral observance and practice of sincere etiquette make up the core curriculum or our dojo. As chairman of both the Jikishin-Kai International and the Nippon Kobudo Jikishin-Kai, Masayuki Smimabukuro Hanshi holds a great deal of personal responsibility for passing on the ancient traditions of Japanese martial arts to the modern world. Masayuki Hidenobu Shimabukuro Hanshi was born in March 1948 in Osaka, Japan. His interest in martial arts began as a teenager, when he studied Judo, Karate-do, Okinawan Kobudo weapons and other traditional Japanese martial arts. He achieved dan ranking in several o these arts before focusing his attention predominantly on Iaido (or Iaijutsu), the art of Samurai swordsmanship. 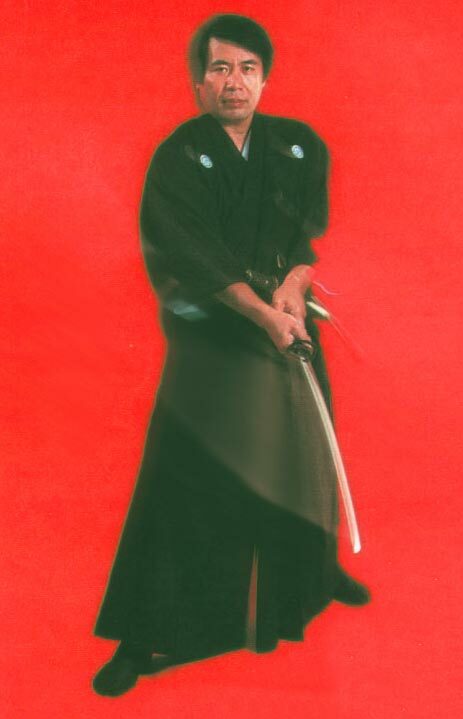 Shimabukuro Hanshi began his sword training in 1975 under the direct supervision of Miur Takeyuki Hidefusa, Hanshi, 20th generation grandmaster of Muso Jikiden Eishin-Ryu in Osaka, Japan. Shimabukuro Sensei was appointed Kokusai Bucho (International Chairman) of the Nippon Kobudo Jikishin-kai by Miura Hanshi, and entrusted with dissemination of authentic Eisin-ryu Samurai swordsmanship worldwide, outside of japan. Since that appointment, Shimabukuro Sensei has traveled throughout the world teaching Muso Jikiden Eishin-ryu Iaido, Shindo Muso Ryu jojutsu and other traditional Samurai arts. He has established Jikishin-Kai International Training Groups and member schools in Europe, North America, South America, Central America, Asia and Australia. Shimabukuor sensei is the senior-most student of Miura Takeyuki Hanshi and is presently the highest ranked member of the Nippon Kobudo Jikishin-kai under Miura Sensei in the world. He is also a direct student of Kenzo Mabuni, the present Grandmaster of Shito-Ryu Karate do Kai. Masayuki Shimabukuro is presently ranked 8th dan in Muso Jikiden Eishin_ryu Iaido (Iaijutsu), 7th dan in Shindo Muso-Ryu Jojutsu, 7th dan Nippon Karate-do-Kai and holds the coveted title of Hanshi. Hanshi is the highest title one can achieve in the Traditional Japanese Martial Arts.